(PFD) or on the system display (SD). This camera system does not display wingtips or wingtip paths yet (photo: NTSB). 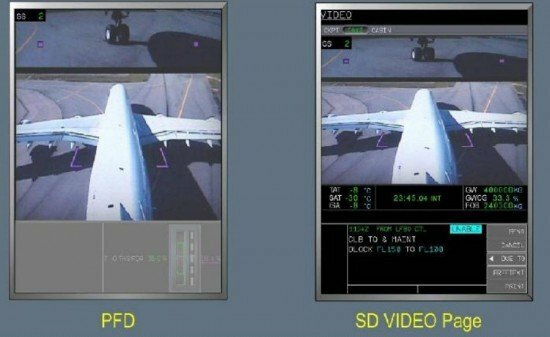 The U.S. NTSB recommended that the Federal Aviation Administration (FAA) require that large airplanes be equipped with an anti-ground collision aid, such as an on-board external-mounted camera system, to provide pilots a clear view of the plane’s wingtips while taxiing to ensure clearance from other aircraft, vehicles and obstacles. On large airplanes (such as the Boeing 747, 757, 767, and 777; the Airbus A380; and the McDonnell Douglas MD-10 and MD-11), the pilot cannot see the airplane’s wingtips from the cockpit unless the pilot opens the cockpit window and extends his or her head out of the window, which is often impractical. The NTSB said that the anti-collision aids should be installed on newly manufactured and certificated airplanes and that existing large airplanes should be retrofitted with the equipment. May 30, 2012: The right wingtip of an EVA Air Boeing 747-400 struck the rudder and vertical stabilizer of an American Eagle Embraer 135 while taxiing at Chicago’s O’Hare International Airport (Preliminary Report). July 14, 2011: A Delta Air Lines Boeing 767 was taxiing for departure when its left winglet struck the horizontal stabilizer of an Atlantic Southeast Airlines Bombardier CRJ900 (Preliminary Report). April 11, 2011: During a taxi for departure, the left wingtip of an Air France A380 struck the horizontal stabilizer and rudder of a Comair Bombardier CRJ701 (Preliminary Report). The NTSB made the same recommendation to the European Aviation Safety Agency, which sets standards for aircraft manufacturers in Europe.